We would like to welcome you to Sea Cliff Cottages. Perched on a hill overlooking the beach and islands below, these five self-catering cottages have become the “Caribbean home away from home” for many of our returning guests. The cottages are spread over several acres of grounds covered with fruit trees and flowers. Each one has its own yard, which adds to our guests’ privacy. The cottages are simple, but very comfortable, and have been built with the environment and surrounds in mind. We have tried to leave a small footprint on the earth, staying away from the over-large, resort style of accommodation, but still supplying our guests with all of the comforts and amenities that are important for an enjoyable holiday. Our hot water is solar heated and our primary source of electricity is from solar panels. Our swimming pool is the ocean with the river to rinse off the salt and we compost our organic waste to use in the vegetable and flower gardens. Being one of the first places to offer tourist accommodation in Calibishie, we are fortunate in having long term and experienced staff to assist our guests and introduce them to our culture and village life. Our main goal is to offer our guests the opportunity to become part of the local lifestyle for the time that they are here, visiting with people and learning of the unique places and things to experience and explore that other tourists may not find. It seems to be working and our visitors have made strong connections with the area leaving not as “tourists” but as friends of the community. This is probably the reason for the large number of returning guests to Sea Cliff over the years. But why take our word for it? Click here for over 150 positive reviews on TripAdvisor. Each cottage is of a different size, from a studio to the two bedroom cottages. More like small houses than cottages, all have cathedral ceilings, complete kitchens, dining/sitting areas, balconies plus outdoor dining areas and BBQ’s. All have free access to a washing machine, and each cottage has a cell phone provided as well as free wireless internet access for those who need to bring some of the outside world with them! The internet may not be as high speed as some are used to, but hey, you are on holiday! Only the studio cottage does not have cable TV. Our balcony views of the sea and islands below can be truly wonderful and the sound of the surf with the soft breeze enough to send even the most hardened insomniac into a gentle slumber. With the palm trees waving overhead and the hummingbirds dancing around the flowers you can lose yourself in the moment giving in to total relaxation. A few minutes walk down a hillside path brings you to Hodges beach and river. Often you will have the beach completely to yourself or perhaps share it with a fisherman casting his net over the waves. In addition, the Hodges River empties into the sea at this point and is a favourite spot for children to play, and for rinsing off the salt after an ocean swim. Woodford Hill beach, Turtle beach and the beautiful Pointe Baptiste beach are also within walking distance. And yes, we do have sea turtles coming to our beaches to lay their eggs. Generally this is in late March, April and May with the giant leatherbacks arriving first and the hawksbills soon after. The turtles are protected by volunteer workers, and it is possible to contact them and view some of the turtles as they come to shore. The village of Calibishie is about a kilometre or a twenty minute walk from the cottages. There you will find grocery stores, restaurants with some wonderful food, a post office, gas station, bank, and most of all friendly and helpful people. Click here for a Google map we did of our area and some of the amenities and attractions. When you are on the map site check the box for the first untitled layer. There are many other places to explore, secluded waterfalls and river pools to swim in, nesting places for parrots, rain forests and incredible views from our ridge roads and paths. For those who wish to dive, there is a five star PADI dive centre located twelve miles away, in the village of Portsmouth, which offers certification courses as well as day and night diving. For more information click on www.cabritsdive.com or visit the site hosted by one of their divemasters, www.liquidguru.com for a wide variety of photos of life on Dominica's healthiest reefs. There really is something for everyone here. Whether you wish to relax on the balcony watching the hawks float overhead, hike up mountain paths or swim out and explore the island in front of the cottages, no one is ever bored …..Come discover and experience the true Dominica with us. 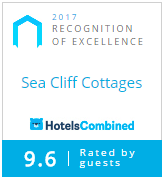 It seems lately every accommodation provider on the planet is either eco-friendly or eco-luxurious or eco-something. . At Sea Cliff Cottages we are no longer sure how to describe ourselves. Our hot water is all heated by the sun and our electricity is generated from solar panels. Even our clothes driers are solar/wind hybrid designs! Our organic waste is composted to fertilize over twenty plus varieties of fruit and nut trees which are there to sample when in season. In short, we have tried our best to blend in with the nature island!